Home » Football Season is Upon Us! 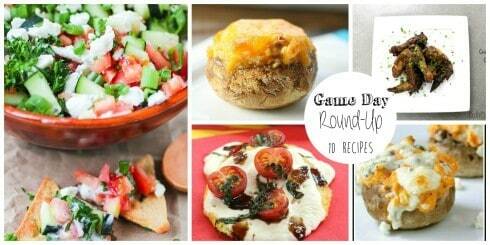 What are you Making for the Big Game? Last weekend was the first official full weekend of college football. As I have stated in prior posts, we worship the round orange ball that makes its appearance in the near future. Being Kentucky Wildcat fans we still watch them play football and cheer for their victory each and every week. Brooks says that the only reason they created football was to give us a reason to sit around, drink bourbon, and talk about basketball season! Whatever the reason you watch, or team you cheer for, one thing is universal: GAME DAY FOOD! We love to tailgate and gather in groups to chow down and cheer on our teams, so there must always be lots of good food around! I have a few recipes of my own that I love for game day, but I have asked a few of my fellow bloggers for theirs! Here is a round-up of those recipes. This collection of appetizers and tapas will be certain to please any discerning tailgater! I hope you enjoy them! Feel free to visit their blogs too and check out their other recipes as well. Rebecca from Strength and Sunshine is starting us off with a gluten-free, vegan, and paleo appetizer that is to die for! Savory black garlic mixed with sweet peas and pesto and served on a crisp cucumber. Plus it’s ready in ten minutes! Get the recipe here. 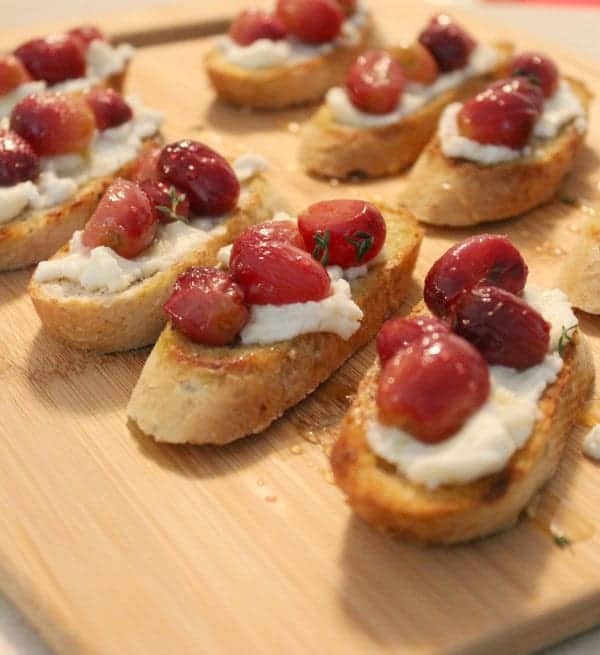 Rachel from Rachel Cooks brings us a sweet and savory Roasted Grape Crostini. Crispy toasted bread slathered with creamy ricotta and topped with sweet roasted grapes. Vegetarians and Carnivores alike will swoon! 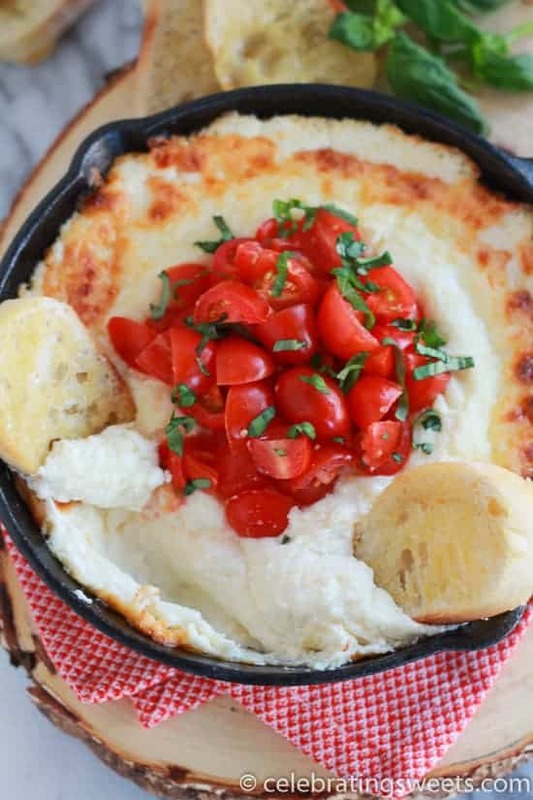 Allison, at Celebrating Sweets, is filling our bellies with a creamy and cheesy Four Cheese Tomato Basil Dip cooked and served in an iron skillet. Less mess is always welcome! 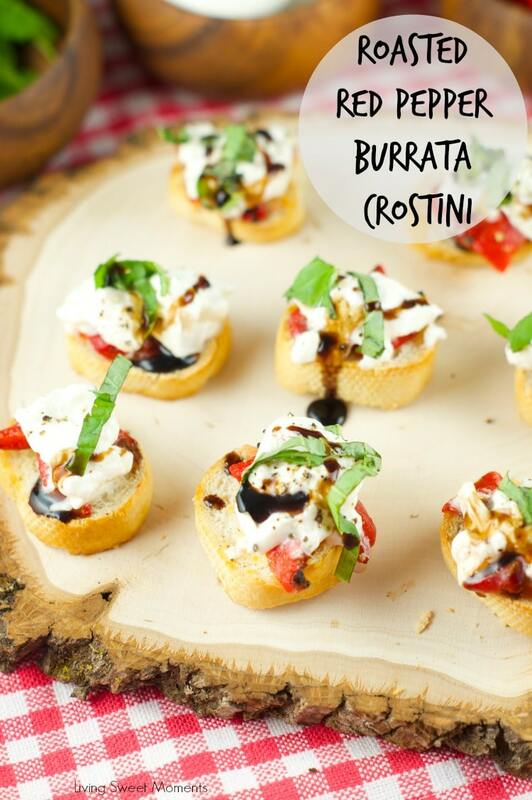 Tiffany over at Living Sweet Moments offers up another crostini, this one topped with Roasted Red Peppers and Burrata and drizzled with balsamic vinegar! Need something lighter? How about this Layered Greek Ranch Dip from Swanky Recipes. Full of chopped veggies and seasoned with the much-loved ranch seasoning! Photo from Leia over at Eat It and Say Yum! Everyone loves jalapeno poppers and Leia from Eat It and Say Yum is wrapping them up in a handy Chicken Jalapeno Popper Eggroll. What a genius way to speed the jalapeno poppers getting into your mouth! A party is not complete without some stuffed mushrooms! Kat and Melinda from Homemade Interest are stuffing their Mushrooms with Chorizo and Cheese. My husband will drool at the very thought! If you love stuffed mushrooms then how about two recipes! These Mushrooms are stuffed with Buffalo Chicken and are a great alternative to wings. Thanks Lisa at Snappy Gourmet! Brianne at Cupcakes and Kale Chips is making some gluten-free mini Caprese Polenta Pizzas. Pizza is perfect game day food and these will fit nicely in your hand! Topped with gooey cheese and fresh basil! The round-up wouldn’t be complete without some chicken wings so here is a recipe for my Crispy Green Herb Chicken Wings. They are baked and tossed with fresh chopped herbs! 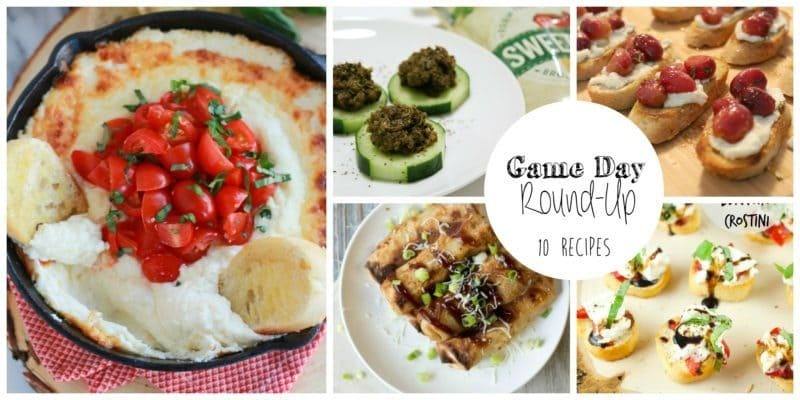 I hope you have found one or two recipes that will grace your game day table the next time you and yours gather to cheer on your favorite teams! What is your favorite game day food? I am so excited for football season! 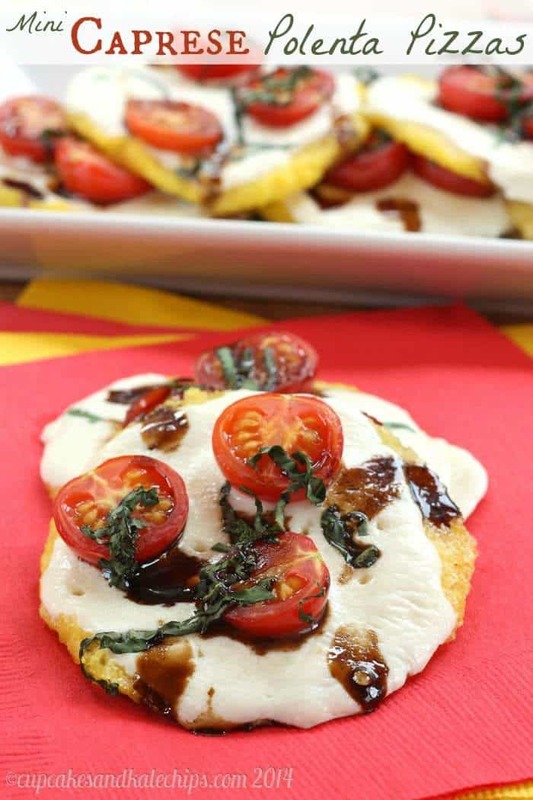 I am needing to make those Caprese Polenta Pizzas ASAP! In fact, everything on your list looks just delicious! Thanks for reading! I love football tailgating and can’t wait to make these for my next party! 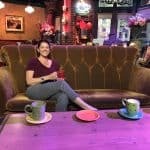 Great round up! I have to try that roasted grape crostini spread with the ricotta this weekend as I have everything needed to make that in my refrigerator. Happy weekend to you! Thanks! I love football food and gathering with friends. 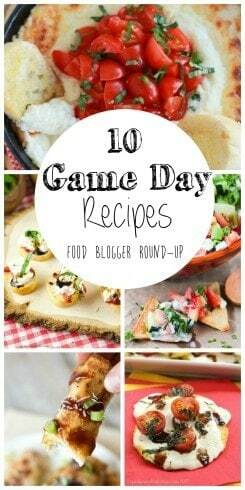 Also easy recipes that let me enjoy the tailgating instead of being in the kitchen! Thanks for letting me use it! I can’t wait to make it for my next football party! Wow! Just in time for me to gather those wonderful tailgating tidbits for my thanksgiving reunion weekend menu. It’s all about football this year! This will be a great start to my meal planning. Thanks to all of the bloggers especially my special one – taketwotapas!! !